There are a minimum of two pieces of equipment required for amplified harp: an amplifier and a microphone. These pieces of equipment work together, along with other optional electronic effects, to produce the final amplification of your sound. It is still your sound being amplified, and your acoustic tone is probably 80% of the final result. If you want to sound good amplified, sound good acoustically first. Another 10% of your tone is from your hand-mic-face cup, though you can't get the first 80% without at least a reasonably air tight cup formed by your hands around the harp and the mic. The importance of good cupping techniques cannot be overstated. An air tight seal around the harp, the microphone, and your mouth, is essential to achieve the fat, full, big, round sound associated with traditional blues harp. 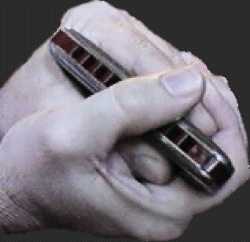 This grip must be worked on and practiced in association with playing the harmonica. The amplification of the harmonica sound provides a very wide variety of tonal color, and your hands and your cup are essential elements of these timbral variations. Let me say right up front that amplifiers use lethal levels of voltage, so messing around on the inside of amps should not be done by unqualified people. Many old vintage amps are in use these days, and not all of them are grounded properly, and some players have been electrocuted. If you decide to get an old amp, make sure it is grounded properly and otherwise safe before using it. Take it to a professional amp tech and get it checked out and fixed up before you use it--consider that as part of the cost of buying an old amp. There are a myriad of amplifiers in various sizes available for guitars and keyboards, and a very few now made specifically for playing amplified harp (with price tags over $1000). In harp amps, however, newer is not necessarily better for getting the sound you want. That sound. That sound is the old Chicago Blues harmonica sound from the 40's, the era of Big Walter Horton, Little Walter, and the Sonny Boy Williamsons, I and II. That sound is from old tube amplifiers and old "bullet style" microphones. The old Fender tube amps of the late 50's and early 60's are highly sought after for amplified harp. Probably the most popular is the '59 Fender Bassman amp, which is shown in the picture. These have been so popular, Fender resumed production of a "Re-Issue" (RI) Bassman tube amp. Many gigging harp players use this Bassman RI as their workhorse amp because of its sound and its volume--they can compete with guitar players in moderately large venues. Tube swapping modifications easily done on the Bassman RI further optimize it for use in amplified harp play--specifically the solid state rectifier is often replaced with a tube rectifier, and the stock 12AX7 tubes are replaced with lower-gain substitutes such as the 12AT7 or even the low gain 12AU7. These tube substitutions allow the amp's volume knob to be turned to higher settings before feedback occurs, which provides more "headroom" for volume adjustments that don't result in feedback. They also contribute to an earlier (less volume) breakup into the sought after tube overdrive distortion. 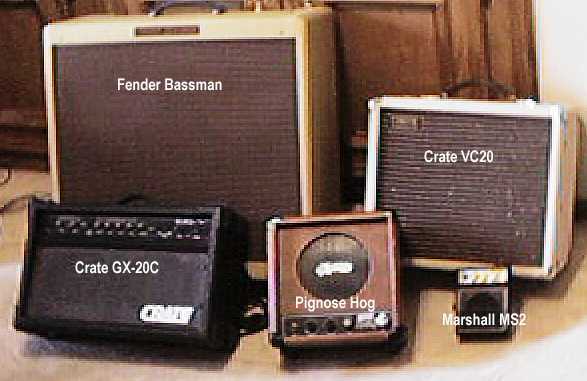 Though Fender amps are the most popular, many other less known "cheaper" amps also work very well for amplified harp. These include the old Gibson and Silvertone tube amps. New tube amps are also being made, including the Crate VC series. The VC20 is shown above, but currently many harp players have been praising the VC508. These are lower power amps, which are also smaller and lighter in weight. Many players prefer the sound of the small tube amps. They work particularly well in small clubs where loud volume is not a concern, but they also can be mic'ed through the PA to amplify the volume of that sound and put the harp in the monitors. One of the most popular small tube amps is the old tube Fender Champ. There are many many solid state amps out there, some of them quite inexpensive, and even though they are not preferred for the classic Chicago Blues sound, they have their own character and can be used for amplified harp, depending on your taste, desires, and needs. Many have multiple channels and/or gain controls where the amount of distortion can be "dialed-in" by the player. The Crate GX-20C shown above has 2 8" speakers which do a credible job of carrying the bottom end, though 10" speakers are normally preferred. The Pignose amps also work fairly well for distorted amplified harp, and they are very portable. The Hog shown above delivers about 10 watts, which is pretty loud for its size, and runs on a large rechargeable battery. There are even "mini" 9 volt battery amps that you can use for practicing amplified play, or can be used essentially as "pre-amps" for a particularly hard edge distorted sound. That's the rub, getting the settings right to get the sound you want. I can't tell you how to dial in the settings on your amp, because it depends on you, your particular amp, your mic, your needs, your tastes, and your environment. Here are a couple of things to keep in mind. Tone controls are not independent. On amps, unlike on your home stereo, changes to one of the tone controls affects the others, so you need to adjust all the tone controls together to work on the sound. Different amps, even the same model amp, have differing setting requirements to get the same sound. Bass needs to be emphasized. Bass controls are usually set well over half way up. Added bass tends to fatten up the sound, make it rounder and fuller. However, because of the interdependence of the tone controls, you need to work with your particular amp settings to emphasize the bass. It may be that a lower bass than treble setting gets you what you need. Treble needs to be de-emphasized, toned down. Treble controls are usually set well below half way down. Added treble tends to be sharp, brittle, and cutting, and can induce terrible feedback. Mid-range can vary quite a bit, but is often de-emphasized. Reverb is normally set to low-to-moderate settings, not much more than half way up. Gain controls work with "master volume" level controls to set the total volume, but more importantly to determine the total distortion you have dialed in. Higher gain causes more overdrive which causes more distortion (and volume). If you want the sound just to be louder, turn up the master volume. If you want the same volume but more distortion, turn up the gain and turn down the volume. If you want the sound to be cleaner, turn down the gain and turn up the volume to compensate. These knob setting adjustments are not equivalent between the gain and the master volume. Smaller changes to gain will generally have greater effects; larger changes to master volume level will have a smaller effect on the overall volume. In other words, a tiny change in gain could require a fairly large change in the master volume level setting to compensate. The amount of distortion and treble you have dialed in, your mic, how air tight your grip is, where you stand, and a lot of other stuff act together to determine how loud you can get your amp before you get feedback. Often tiny changes to the volume knob make all the difference in the world to whether your rig feeds back or not. The importance of a good air tight cup cannot be overstressed. The difference could be that sound you want, without feedback. The other essential half of the equipment equation is the microphone. As with amplifiers, a wide variety of new and vintage microphones are used by amplified harp players. The most popular by far are the old "bullet" style mics shown below: the Shure Green Bullet and the Astatic JT30 (the picture shows the VC model with a volume control), or close cousins like the Hohner Blues Blaster. One of the primary determining factors of a microphone's sound is the element, and there are several different elements available, including crystal, dynamic, ceramic, and controlled magnetic. The Green Bullet and its dynamic element (older models may have different elements) provide a highly sought after type of distortion that works well with tube amps to fatten up the sound of the harp. The Astatic JT30 typically has a crystal element, which provides a certain classic bite or edge to the characteristic tube distortion. You might think of it being akin to the difference between Gibson Les Paul and Fender Stratocaster guitars.. classic sound with different character. Many players have more than one mic, and many search long and hard for the perfect mic--just as they search for the perfect amp. The trick is, you have to search for both at the same time, because certain combinations work better together than others. The element is so important that two seemingly identical mics can sound quite different, so many players try to "cherry pick" mic elements to find the ones they prefer best. Some players prefer not to worry about carrying amplifiers and will play right through the PA. A common PA mic is the Shure SM-57 shown above, or the SM-58 which is very similar but has a round ball end. These mics are normally preferred to amplify acoustic play, or when playing "clean", without much overdriven distortion. When mic'ing for an acoustic style, the microphone is not held in the hand and cupped, but is mounted on a stand and often placed a foot or more away from the harp. Some players will vary their distance from a stand-held mic, sometimes even cupping the mic, then backing away to provide variety to the harmonica sound. Smaller mics can be used to aid in getting air tight hand cups as well as allow for a wider range of hand effects, including "wah wahs". Small inexpensive electret battery powered "tie clip" style mics, like the Radio Shack Optimus 33-3013 shown above, work well for holding a mic utilizing normal acoustic hand techniques. They sound good, but don't provide the characteristic distortion desired by many players. Even cheap generic cassette recorder mics work fairly well for amplified harp because their limited dynamic range is what works best for harmonica anyway. They can make useful practice mics, and work pretty well with the "mini" practice amps, though they wouldn't get used in a professional environment. The Strnad mic above is designed specifically for the harp, actually holding the harmonica in a sealed plastic cup. Their sound is pretty clean, and they can be easily used to amplify a harp held in a rack for hands-free play, such as when playing guitar and harp at the same time. Many different types of mics are available. Other popular models include the Shaker mics, which are smaller and lighter than the bullet mics, and easier to cup. 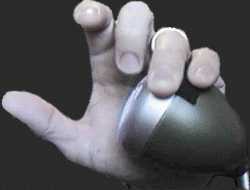 The "Madcat" shaker is specially designed to fit easily in the hand and allow tight cups and good hand effects. The Ruskin mics are fancy looking smaller bullet style mics with standard bullet mic elements that sound very good and are reasonably inexpensive. 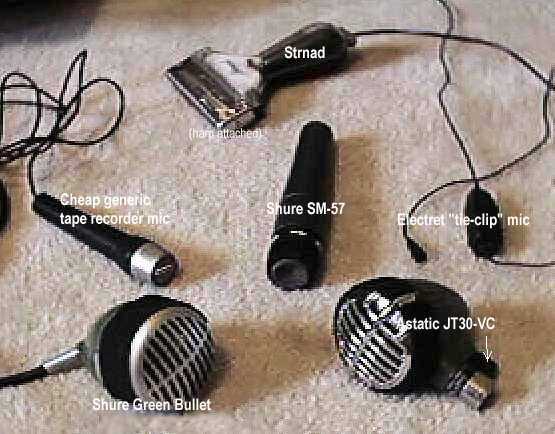 As you can see in the picture, some mics like the Green Bullet come with a cord attached, and some like the Astatic JT30 and the Shure SM57 do not. 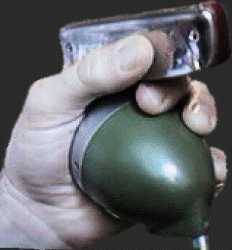 Many players prefer a replaceable, detachable cord and modify their Green Bullets so that a cord will plug in. Astatic JT30 mics require a special "pin-3 hot" cable, or their sound is very thin and wimpy indeed, instead of the hot biting sound the Astatic is known for. If you're having trouble with your Astatic, make sure you're using the right cable. 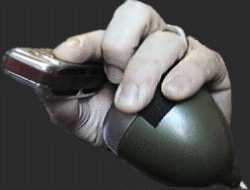 Just about everyone steps on the cable and pulls the mic out of their hand from time to time. Some players improve their mobility by using "wireless" microphone rigs, which uses an antenna (or more than one) and radio waves to transmit the microphone signal. These work quite well in general, and allow some performers to walk out among the audience, jump on the bar, and otherwise enhance their act. They also insulate the player from the lethal voltages running through the amp. Many players add volume controls, modify them, remove them, change their "pots" and capacitors, modify the connectors, and so on, to suit their ears and needs. A few mic specialists are available, including Tom Ellis of Tom's Mics in Dallas Texas who sells well set up vintage mics, and Dennis Gruenling of New Jersey who does custom microphone modifications. First, hold the mic with your ring and little fingers of your left hand. Then hold the harp between your thumb and index finger of your left hand. Close your right hand around the mic and press the base of your palms above your wrists firmly together to form a tight cup. Form a tight seal around the mic and harp, and use your thumb against your face to get a second cup to seal your embouchure. 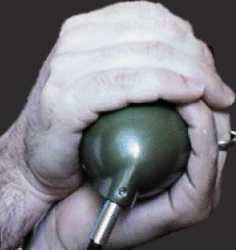 A reasonable one-handed cup can be made by pressing the face of the mic flat into your palm. You'll have to fiddle with the mic placement a bit to get the best sound from the small cup formed between the crease of your palm and the face of the mic. Any effects used for guitar can be used for harp, though a very much smaller set of effects are used very often with amplified harp. The most common harp effects are reverb and delay. Distortion-type effects are not often used--they tend to add too much distortion, distort in an unpleasing way, and they often cause an unacceptable amount of feedback. Reverb is most often built into the amplifier, such as in a Fender Princeton Reverb and many other tube amps. There are also external reverb "tanks" that can be add reverb to the dry amplified sound. Delay is an effect that provides varrying degrees of echo to the sound. Typically only a small amount of delay is used, to simulate a moderately sized room for example, or even a large empty hall. However, delay lengths can be varied from very short to very long, and provide "slapback" type echos that decay over varying lengths of time--or not. Many players prefer old-style analog delay units, but many modern digital delay pedals and boxes are available. Many effects boxes include many many different effect types that you can selectively apply to your sound, program, and experiment with to achieve the sound and effects you like. Your mileage may vary, but it's good to think of adding effects as being like adding salt to meat. A little is good, just the right amount is wonderful, and too much is awful.